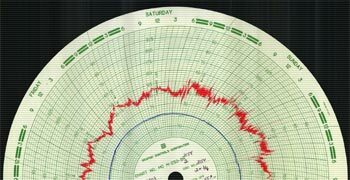 Once a chart leaves the meter itself and is shipped to a chart processing company, it's often not seen again (or not easily seen) by the producer. In some cases, this can cause real problems. However, if you're a client of R L Laughlin, that's a problem that you no longer have to think about. 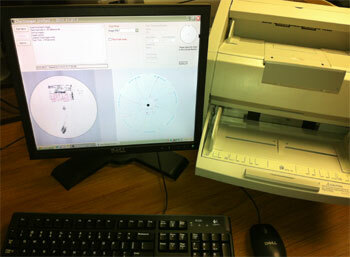 We have implemented a process that allows us to create high quality digital images of every gas chart that we process. From high-end scanning equipment to custom gas measurement software applications, our dedication to go above and beyond for the client is no more obvious than in our efforts to scan, identify, catalogue, and store an image of each natural gas chart that enters our facility. In addition to gas charts, we image every meter test report, meter test chart, and gas analysis report that we receive. So now, in addition to viewing images of your gas charts online, you can also view high quality images of your meter testing results with the simple click of a mouse. Natural gas charts can be torn, stained, or lost. When you bring your chart processing business to us, access to your gas chart images is assured, even if the actual paper chart can't be found, or is in some manner destroyed at a later date. We've tied this unique and valuable feature directly to our web portal so that our clients can view high quality images of their charts alongside the gas volume data. This side-by-side comparison of gas volume data with real-world gas chart images allows our clients to review our work, and helps to create a level of trust you simply won't find elsewhere. Additionally, we can place copies of gas chart images on a removable storage drive and ship that drive to the client for review or storage purposes.